(I’ve got a date with Big Sur on April 29) and, shaking the pebbles from my shoe somewhere between mile 17 and 17.5, I notice two (helmeted] bikers), a mom and her teenager, pedaling past, their cell phones in hand, texting...TEXTING! It had to happen, right? We can’t resist doing it while we’re operating two-tons of metal traveling upwards of 40 miles an hour, divided by oncoming traffic with nothing but yellow paint…of course we’re gonna try it on our bikes, or while we’re walking, running (I have no idea how you people do this), or pushing an SUV-size baby carriage along this narrow, often very busy trail. Heralded as one of the finest recreational areas in the land – and in Runner’s World as every runner’s paradise, the American River Parkway (a.k.a. The Jedediah Smith Memorial Trail) stretches for 32 uninterrupted miles. Beginning in Discovery Park, the shaded trail twists along the riverbanks, under our great bridges and past California State University, Sacramento into sunny Fair Oaks, Gold River, finally climbing to the beaches along Folsom Lake. It’s estimated that five to eight million equestrians, power-walkers, runners, hikers, and of course, bicyclists enjoy it every year. With triathlon season (and the annual Parkway Half Marathon) upon us, along with CIM in December, usage is at peak this spring and next fall. Which ups risk. 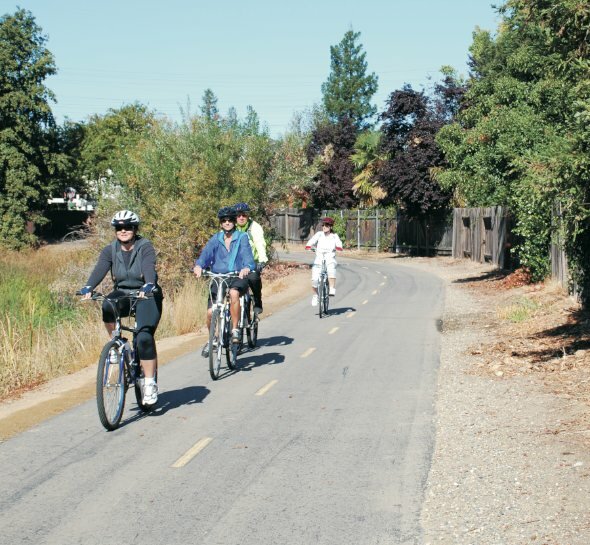 While crime peaked in 2009 – with several incidents including an assault on two cyclists in the Lower Reach and an at-gunpoint carjacking of a couple on the trail in Fair Oaks making headlines – criminal activity is down this year. Most of the danger people face on the trail these days is due to their own foolish behavior. Safe Passages. When you are passing me, pass on the left and then move to the right. To make passing easier for everyone, especially when the trail is busy, please run and bike single file! There are spots on the trail where there simply is no room for a runner or a biker to pass two (or three) individuals taking up the trail. Slower traffic on the trails should move to the far side and allow for plenty of passing room. (And Moms? The bike trail is NOT the best place to take your baby out in the carriage. Especially not if you insist on pushing it down the middle of the bike trail. You need to use the shoulder – or better yet find a park! It’s safer. ) Finally, please don’t get all huffy (or suggest I kiss your posterior) when I yell “On your left!” Bikers and runners are supposed to do this; we are warning you of our passing. Just allow us to do so as quickly and safely as possible. Safe Stopping. Stopping in the middle of the road is not a good idea. You see this a lot with the casual bikers, some of the runners, and a lot of walkers who stop to take a picture of a bird or a tree. You see little kids doing this, to wait for their parents to catch up on their bikes. Get over to the side of the trail as far as you can, please! Obey all traffic signs. Those stop signs, like the one right before mile 12.5 on the trail that no one obeys? OBEY IT. There’s cross-traffic entering the park, and many users utilize these points as a turnaround or meeting point. Don’t breeze through them. Also, the speed limit is 15 miles per hour on the trail, and you WILL get a ticket if a ranger happens to tag you going all Lance Armstrong out there. Pay attention to the road. If you need music to take your mind off the exertion (and let’s face it, many of us do), keep the volume low and/or use one earbud, especially when the trail is especially busy and/or on the narrow areas (the 22.5-mile mark near the Hazel Avenue bridge, for example). Look around, same as you should while driving. What are other people doing? Are there people coming up behind you, who will need to pass you? Stop and pull over if you need to use your cell phone, especially if you’re texting. Finally, the road is the road. You wouldn’t just meander out onto Folsom Boulevard without looking both ways and/or watching where you’re going. Don’t do the same on the bike trail, especially, for instance, near the Folsom footbridge heading up that hill at mile 28.5. You can bet that bikers will be coming down it. Great for training, not for training wheels. Most of the most experienced riders try to use the trail when fewer others are on it, it’s true. But it’s still a trail for bikers (and runners) who know what they’re doing. They know the rules of the road – and the general etiquette. If you don’t know these, find out what they are before heading out. Especially before heading out with the family. And please think twice before taking your kids out there on their training wheels or their new two-wheeler: The bike trail is really not the place to learn how to ride a bike. The bank parking lot on a Sunday might be a better place. Night Riders. I was once hit head-on by a biker riding at night without a headlamp. We tumbled down a gully and collided with a tree. I was covered in blood. His. We both probably should have been more noticeable; we both should have been more careful. Wear reflectors, reflective wear, and appropriate lights. Skater boys, Hell’s Angels, sorry. Skateboards and motorized vehicles are not allowed on the bike trail. The same day I spotted the texting (mentally still grousing about that at mile 15, which is probably why I wasn’t paying attention) a man on a bike – who was clearly not a biker, if you know what I mean – caught me by surprise. Pedaling slowly, he moved next to me (going the wrong way on the road). He didn’t say much, just kept motioning with his head toward the bushes. After casually suggesting he move along, then ignoring him, I was becoming anxious when I spotted a walker up ahead. He did, too, and sped off. I asked the walker to use her cell phone and call the rangers for a patrol, which she was happy to do. These things happen. Carrying pepper spray, available at most sporting goods stores, wouldn’t be a bad idea. Avoid going the trail alone. In case of emergency, the call boxes may not look like they work, but they do (watch out for black widows). Keep track of the mile markers so you can give your location. Contact Park Ranger Dispatch at 916-875-PARK (7275) to request assistance, or if you are within the Folsom Lake State Recreation Area, you may contact the State Park Rangers at 916-988-7322.